We’d love your help. 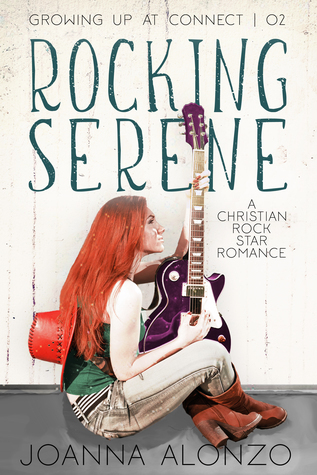 Let us know what’s wrong with this preview of Rocking Serene by Joanna Alonzo. To ask other readers questions about Rocking Serene, please sign up. Wow wow wow, i think i just found a new favorite Christian author. Wow. I loved loved this book. I got it as a freebie but wow, i defiantly would have bought it no doubt. Thank you for your generosity! The story line is your about a boy and girl, GOD and Music . I don't want to go into detail about the story line and spoil it for future readers but its so real. not mushy mushy at all. Nolan and Serene s story is so romantic but in a real way you can totally relate to not in a "this can never happ Wow wow wow, i think i just found a new favorite Christian author. Wow. I loved loved this book. I got it as a freebie but wow, i defiantly would have bought it no doubt. Thank you for your generosity! The story line is your about a boy and girl, GOD and Music . I don't want to go into detail about the story line and spoil it for future readers but its so real. not mushy mushy at all. Nolan and Serene s story is so romantic but in a real way you can totally relate to not in a "this can never happen in real life" way that some romance authors tend to adopt. I loved the fact that God was so prevalent in this book, you didn't have to LOOK for HIM like the angle some christian authors tend to take. A story of two people who fell in love and lost their way. Redemption and grace, true love and the supernatural! I love this story! it was so relatable in a sense where they EXPERIENCE the presence of God in a miraculous way and yet still find themselves questioning His existence, which is so refreshing because its something almost every Christian has to deal with. I also love the fact that true love prevails between them, even though they went through so much heartbreak. I found myself feeling A story of two people who fell in love and lost their way. Redemption and grace, true love and the supernatural! I love this story! it was so relatable in a sense where they EXPERIENCE the presence of God in a miraculous way and yet still find themselves questioning His existence, which is so refreshing because its something almost every Christian has to deal with. I also love the fact that true love prevails between them, even though they went through so much heartbreak. I found myself feeling for both of them; sad when they were sad and happy when they were happy. I would definitely recommend this book, Joanna is a brilliant writer and does well to draw the reader in and her stories are SO relevant to our lives as Christians in church and everyday life. Quick read but packed with emotions! A great story that tugs at your heartstrings. The story was well written, I could feel the emotions from each character it was hard to stop reading. One thing I loved about this book is that it gave a glimpse of struggles faced by teens and young people specially those who grew up in church. Would definitely recommend this book to those who are at a crossroad, broken or struggling with their faith and basically to everyone. It's a must read!! Loved this book that on the surface is about 2 childhood friends and their journey as they each chase their dreams. Can they share a future when they have different values? However the best part of the book is the deeper journey of their walk with God from attending church as children to discovering what part faith and God needs to play in their lives as young adults. They have to answer whether God is just a part of their past or is He heir main reason for living? This is a faith filled romance that follows a pair of kids from age 5 through early adulthood. It is a fine story that is sweet and clean. The plot is good and the characters well developed. I will be looking for more of this author's work. I received this book for free and voluntarily chose to post my honest review. I really enjoyed this book! Joanna, thank you for the ARC! Nolan and Serene will stay in my memory for a long time. The faith, hope, love and forgiveness wrapped up in a rockstar love story was fabulous! As with Crazy Jenna we are given a beautifully written story of finding love, losing faith, going astray and coming home. I really like that the struggles of the characters seem real and relatable. I don't normally read books with religious beliefs. But I didn't mind this book. I received a complimentary copy of this book from the author, Joanna Alonzo. Opinions expressed in this review are completely my own. Rocking Serene made for a cosy read. It took me back to high school days with the forbidden love story. Watching how the story unfold and to see that love remained throughout the book was sweet. It is filled with experiences that are so relatable. The emotions throughout the book was heartfelt. Thank you for the opportunity to read this book, Joanna. awesome book, i loved it music,painting,love,god it was an good book could not stop reading it. i am so happy serene gave him a chance and said yes finally so that was awesome great book.